Toronto FC will be recognizing one player or coach each month for his outstanding work in the community and commitment to being a positive representation of the team off the pitch. As a special thank you, Toronto FC partner Benjamin Moore will be creating a custom portrait of each player to recognize their contributions. 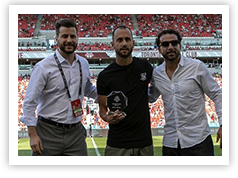 The Toronto FC Community MVP for May is Victor Vazquez. This month, Victor appeared at a local soccer tournament benefitting pediatric brain tumour research at Sick Kids Hospital. Victor signed autographs for students, and later made a personal donation to the foundation at Sick Kids Hospital. Thank you Victor, for your contributions to the community. The Toronto FC Community MVP for May is Drew Moor. This season, Drew continues his donation of tickets to every home game to Toronto Youth Development. Thank you, Drew, for your contribution to youth in the community.